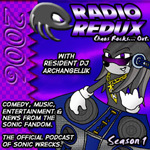 The quest to restore all Radio Redux shows continues with last week’s show #505 (show notes aren’t up yet for this one) and a old favourite from season one, #113 returning. 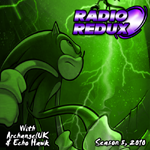 Don’t forget Radio Redux will be broadcasting live later today at 7PM UK time, 2PM EST on Radio SEGA and SEGASonic Radio. Radio Redux #113 – Under Siege! The Next Gen war has begun again, but SW HQ is under attack from Metal Sonic’s forces! Despite this, AAUK along with returning guest Echo Hawk talk third party Smash Bros, the SSA and are Espio and Echo sitting in a tree? Plus lots of music and a ton of news from the games industry.